So, here’s something. When I started this blog, I didn’t really know how to make a delicious fluffy buttercream. I didn’t know how to properly cook for myself (the college dining hall took care of my food). I didn’t feel comfortable tweaking recipes even the slightest bit. I didn’t know how to decorate cupcakes or cakes, which is a serious life skill. I was just a senior in college, not really knowing what the next three years had in store for me, other than graduating and not having access to that amazing dining hall. Seriously. It’s been 3 years and I still miss the Usdan dining hall (insert sobbing emoji here, please) and think about it WAY too much. Over the past three years, I graduated college, moved home for a few months, turned 23, and moved to LA where I had approximately one friend (hi Julian). I met an amazing group of girls out there who I know will be around for a long time to come. I lived in a house and two different apartments. I pursued my acting career while also working one too many jobs. I dealt with a breakup. I had to put down my horse and soulmate of 13+ years and then two weeks later I lost my grandfather, who I was incredibly close to. I turned 25, did a lot of traveling around California with friends and hugged a lot of trees (#ilovetrees). Then, a month ago, I moved from LA back to NJ while I figure out where I want to live in NYC. And that’s where I’m at, in a very small nutshell, back to where I had started, about to start the next chapter in my life. Except now I’m 3 years older, have learned a lot, grown up in life, and I’ve grown a lot in the kitchen. Not too shabby, right? You know what’s definitely not too shabby? I’ve had some of my favorite recipes pop up this year. I FINALLY posted about my favorite pumpkin cream cheese muffins, made s’more cheesecake bars that my bookclub went craaaazy over, first experimented with overnight oats which prompted a breakfast revolution for myself, my friend Lindsey, and my mom. I also made some awesome flourless peanut butter chocolate chip cookies that I’m currently dreaming about, and I made some adorable little mini raspberry hand pies that disappeared in about 2 seconds (no joke) at work. Oh, and I made fondant FROM SCRATCH to top some pretty delicious cupcakes. I was featured on Buzzfeed with my Pita Pizza recipe. I’ve had readers from all over the world check out this blog. These quinoa granola bars are still my most popular recipe to date, and I remember I died when Jessica from How Sweet It Is posted a link to my blog once upon a time. I’ve written over 200 posts, which is just baffling that I’ve had that much to say. I will admit, I haven’t posted nearly enough and I have quite a few recipes and pictures on backlog. And I know I’ve been apologizing in other posts for my silence on the blog and that I needed some time to myself, and it was true, but then I wouldn’t post again for a couple of weeks or months. For that, I apologize. I was baking and taking pictures with every intention of writing a post, but I kept hitting a block and maybe it was growing pains (get it, because the blog is 3 now? …..I’ll shut up). I think, though, that now I am finally ready to dive back into this little old blog of mine and give it the TLC I know it deserves. So Happy (belated) Birthday, Confectionary Tales. You’re the best blog I could have ever asked for. P.S. 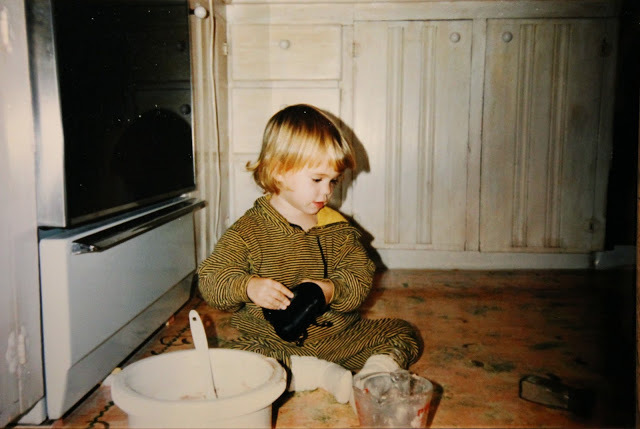 I hope you all enjoyed that adorable picture of me as a blonde little Swedish child on the kitchen floor playing with all sorts of kitchen supplies. You’re welcome. P.P.S. If you’ve made it this far in the post, I didn’t mean for the post to get as serious as it did, but what’s a birthday celebration without a few tears, am I right? P.P.P.S. If I still have any readers out there, you’re the best. I want to send you all the hugs.